World Security’s interactive security systems are far more reliable and more secure than typical alarm systems. With a dedicated cellular connection, your home is protected even if the phone line is cut or the Internet is interrupted, and for 24+ hours after a power failure. We’ve also developed exclusive, patented technology that provides a superior level of protection and awareness for you and your family. Unlike traditional home security systems, World Security’s completely integrated suite of interactive security services offers flexible, easy-to-use solutions that learn and adapt to fit your unique needs. We are here to support your business or home if you need help in an emergency, or simply want to open your doors. World Security adapts, learns and automates your everyday life to give you peace of mind and security. Watch your kids arrive home from school safely. Receive an image alert or text message when they open the front door after school hours. Be sure that your home is always protected. Receive an alert if you forgot to lock the door or arm the alarm system. 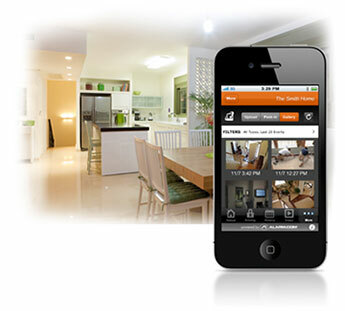 Then lock up and enable your home security right from your smartphone. Arrive home to a comfortable environment after a long day at work. Set your lights and thermostat control to automatically adjust when you get home and disarm your system. Reduce energy waste and unnecessary expense with World Security’s energy automation. Set Smart Schedules to easily manage your lights and thermostat settings based on your home’s activity patterns. Want the smartest house or business on the block? World Security can tell you what’s going on the moment it happens. With World Security, you receive a text or email message automatically when there’s activity that you would like to know about. Click here to find out more. During an emergency, communication from the right person is key. That’s why World Security integrated emergency two-way voice technology support into the security panel. Click Here to learn more. Dedicated wireless connectivity from World Security gives you a Xone of protection even if the phone line is cut, the Internet goes down or the security panel is damaged. World Security’s wireless home security will operate for 24 hours on back-up battery power, keeping you secure during a power outage. Learn more here. Know when there’s an emergency at home, no matter where you are. When a problem is detected, World Security immediately signals the monitoring station and sends you a text or email notification. Click Here to find out more.